As practicing scientists we believe strongly in engaging with the public and with our local community. Our campus runs an active Science and Society program which organises public lectures and other events. However it is difficult to reach these events from various parts of Bengaluru. 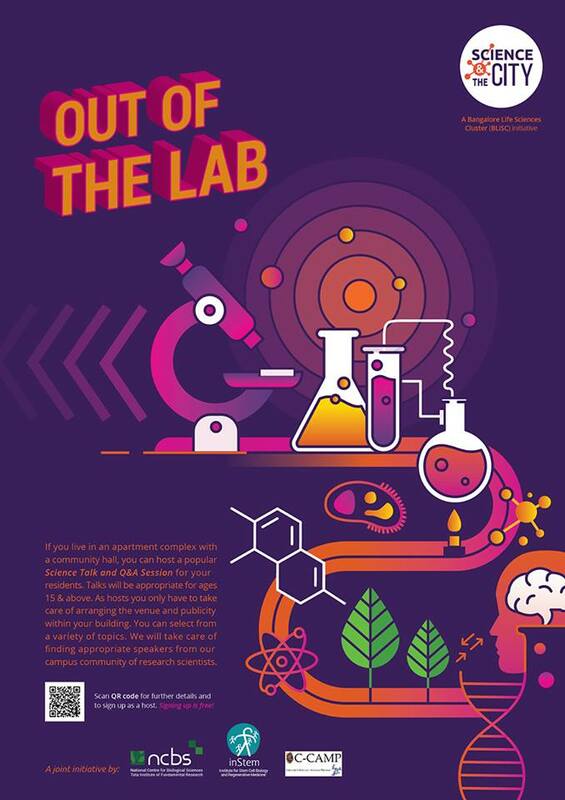 So the National Centre for Biological Sciences (NCBS), the Institute for Stem Cell Biology and Regenerative Medicine (inStem), and the Centre for Cellular and Molecular Platforms (C-CAMP) have teamed up to take science off campus, straight to you. Are you interested in hosting a public science talk? If you live in an apartment complex with a community hall you can host a public talk and Q&A session by a life scientist for your residents or your neighbourhood. The purpose of these events is to encourage two-way dialogue between scientists and the public. If you are interested in being a host please fill in this webform and we will try our best to reach you. You can choose one or more topics of interest, and we will endeavour to find an expert speaker in that field, from among the community of research scientists and post-doctoral fellows at NCBS and inStem. These talks will be accessible to high-school students (15 years +) and older audiences. We will provide a soft-copy flyer with details about the speaker and the talk, which you can use for publicity. We will also take care of the speaker's transport to and from the venue. As hosts you should take on the responsibility of coordinating the event. This includes: (1) Ensuring the hall is booked and suitably set up with sufficient seating. (2) Arranging for projection and audio facilities if possible. (3) Providing basic refreshments for the audience. (4) Taking care of publicity within your apartment complex. You will NOT be required to make any payment to the speaker. This is a rolling call. All new requests which arrive by the 1st of every month will be sent a positive or negative response as soon as we can, and we will try our best to schedule the talk within the following 30 days. Talks will primarily be delivered in English, but over time we will work toward developing talks in other languages.